Discussion in 'Contrails and Chemtrails' started by NikTesla, Jul 25, 2014. Since when did airplanes start using water for fuel? So even without additional geoengineering salts being sprayed behind a plane, what comes out the exhaust is definitely full of chemicals, not water. Not too long ago they even put lead in jet fuel to make it burn at a higher temperature. So how do you really believe it is just harmless water, and not a chemical cocktail coating our sky? I would love to get my hands on a water powered car or airplane if you know how to make that happen! Jet Fuel is Kerosene, a hydrocarbon = hydrogen and carbon. Since the oxygen adds to the mass, burning a gallon of jet fuel actually makes more than a gallon of water. My A330 creates about 7 tonnes of water per hour during cruise. About 13 tonnes per hour on takeoff. Mick, nice try, but no, it isn't as clean and harmless as you are being paid to tell people. "Aviation fuels consist of blends of over a thousand chemicals, primarily hydrocarbons (paraffins, olefins, naphthenes, and aromatics), additives such as antioxidants and metal deactivators, and countless impurities. Principal components include n-heptane and isooctane..."
When a hydrocarbon burns in oxygen, the reaction will primarily yield carbon dioxide and water. There are some small amounts of other chemicals in it, and the combustion is not perfect, so there is pollution in the jet engine exhaust, much like in car exhausts, or kerosene heater exhausts. Jet fuel or aviation turbine fuel (ATF) is a type of aviation fuel designed for use in aircraft powered by gas-turbine engines. It is colourless to straw-colored in appearance. The most commonly used fuels for commercial aviation are Jet A and Jet A-1, which are produced to a standardized international specification. The only other jet fuel commonly used in civilian turbine-engine powered aviation is Jet B, which is used for its enhanced cold-weather performance. No, he directly answered your question by explaining the chemical reaction. You just changed the subject and tried to disguise it as a rebuttal. Not too long ago they even put lead in jet fuel to make it burn at a higher temperature. Or, PLEASE provide a "source" to back-up this claim. KNOW that I have been operating airplanes that burn Jet-A1 fuel for over three decades. The fuel hasn't changed....else, I would know. Since when did airplanes start using water for fuel? AND of course....politeness policy forbids....but "I SMELL A RAT" here. NOBODY...and I mean NOBODY EVER, EVER made such a claim. Exactly. You didn't know that the second largest component of jet exhaust was water. Now you try to change the subject? What I would suggest sir (or madam) is....GO learn to fly. Take the time....it's expensive, yes. Alternatively....GO to the nearest major airport and SEEK OUT SOME PILOTS...you can find them easily, in their uniforms. ASK them these questions....IF they have time, they will (usually) be very helpful. Pilots LIKE to educate people. NOW....(they might get annoyed at this) but you can ALSO find pilots while they are waiting for the Hotel Bus....we sometimes wait a LONG time (which IS annoying!). But, this is an opportunity. I know that as a "passenger" you can also be granted a brief access to the cockpit....BUT if you want a longer conversation? Find pilots OUTSIDE the cockpit. Most of you have listed including n-heptane and isooctane are hydrocarbons. The results of burning them along with the kerosene is the same. Carbon Dioxide and Water. Compared to most automobiles it is an extremely clean exhaust. Nothing you listed negates what Mick or TWCobra have told you. To be fair, it's a reasonable misunderstanding. It's quite surprising, the amount of water in jet exhaust. Not surprising when you think about the chemistry, but it's not exactly intuitively obvious. Yes but....the "quote" was that jet engines "burn water" as fuel. This needed to be stomped down...as false. The "result" of burning hydrocarbon fuels INLCUDES water (or, the molecule H2O) as a by-product. Clearly he was being sarcastic though. It was a rhetorical statement intended to raise the question of where the water comes from. It's always best to treat newcomers in good faith. Style of communication notwithstanding. Oh. I missed the "sarcasm". Sometimes I take people too literally. "Sarcasm" doesn't translate well in print, on the Internet (I KNOW because I've tried to be "funny" online....usually with disastrous results.). Dave Barry can do it....I? Cannot. I noticed it said Kerosine combustion by-products depend on several variants, and I was just wondering how those variants effect the overall combustion and or yeild in by product. Take altitude for instance, is more H20 created at lower or higher altitudes where we see evidence of contrails, or is the rate of H20 production similarly but we don't notice it's output because it isn't cold enough until you reach a certain altitude. Secondly, aren't the by-products formed in the engine as it exhaust, so how could temperature effect the by product if the temperature of the engines remains constant depending on the rpm's. And do older engines produce more amounts of bi-products then newer engines, or is it a minimal difference. ... what comes out the exhaust is definitely full of chemicals, not water. Very little in terms of the amount of water. The variations are just to do with the chemical reaction of combustion. Temperature and humidity will have a bit of an effect. But really if something is burning without visible smoke, then it's pretty much fully combusted, and you are going to get 99% water and CO2. What about the water or moisture already in the air ? A jet engine or any combustion engine is just a vacuum and a exhaust . I get plenty of water out of my air compressors and there is no combustion there . I thought it was mostly moisture in the air more than the Engine making the moisture . Which would explain the gaps in persistent trails . If the Jet engine always produces water there would always be contrails at high altitudes ? Good point. The water in a jet exhaust is in the form of a superheated gas when it comes out. If you could just capture that gas, and keep it in one place, and let it cool down, then you would indeed always get a cloud. However, the exhaust is mixing very rapidly with the external air. This mixing is what makes it cool down so quickly, but it dilutes the density of water vapor in the air. At some point it's cold enough to condense out. But it's only going to condense out if the relatively humidity of the mixing air + exhaust goes above 100% at some point. So this is greatly affected by the existing water in the air. This is why you keep seeing these graph. It shows the exhaust going from B to A as it mixes with the ambient air. B is the exhaust, always the same temp and water content. A (1, 2, and 3) is the ambient temp and humidity. 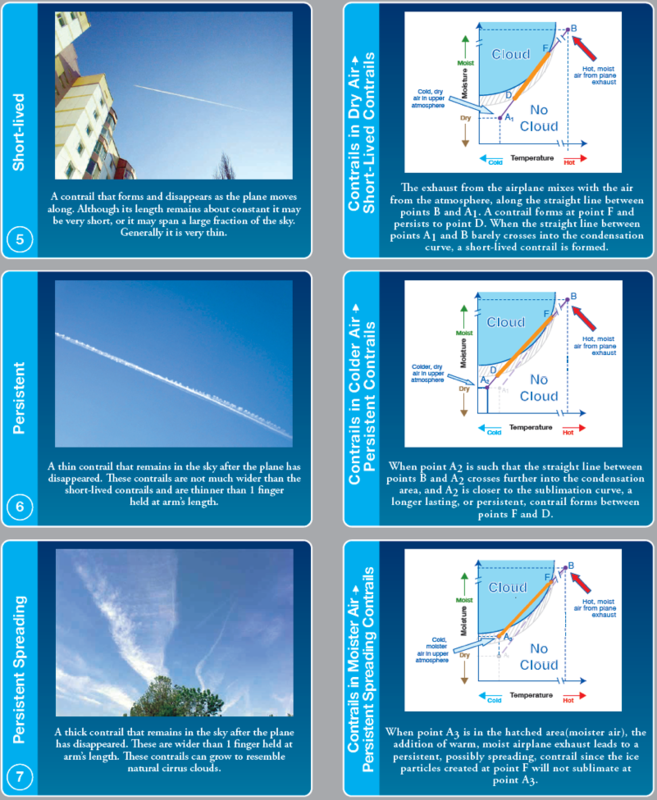 See how a different value of A affects if a contrail forms or persists. (not shown is the case where no contrail forms at all, but you can work that out. Mick, nice try, but no, it isn't as clean and harmless as you are being paid to tell people. That's an odd way to say 'thanks for answering my question about how water can exist in jet exhaust'. Just think about what you wrote there. It makes no sense. Is exhaust the same thing as fuel? No: exhaust is what you get after you have burnt the fuel. 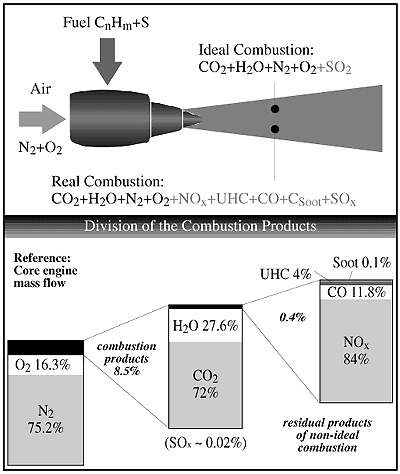 Combustion products are oxides. Fuel is made up of CARBON and HYDROGEN (it is a hydrocarbon) so the combustion products are oxides of carbon and hydrogen. Specifically CARBON DIOXIDE and DIHYDROGEN MONOXIDE (aka water). As already stated, you get more water coming out of the exhaust than the amount of fuel you burn, because most of the mass of a water molecule is oxygen, which comes from the air. If you get a persistent contrail, then this water is added to by water freezing onto the ice particles. In fact it has been shown that only about 1 part in 10,000 of water in a persistent contrail comes form the exhaust. The rest was already there in the air. I have said it before: if you melted down a contrail it would be far, far purer than any bottled "mineral water" you can buy. does that mean that your A330 producing 7 tons of H2O is producing about 20 tons of CO2 ? and is that a lot, or is it not much compared to what is coming from car exhausts ? And, "NikTesla" ( )...if you wish to bang on about the chemicals included in aviation fuels...well, you'd better ALSO add the fuels used in ground vehicles as well....fuels that when combustion occurs, YOU (and I and others) breathe in, right here at ground level. Yes that is about the correct number. Car exhausts are also about the same ratio. There is some research around that says aircraft CO2, being directly injected into the upper troposphere, has more of a forcing effect than otherwise. The other thing to look at though is efficiency. I can move 300 people and 25 tonnes of freight 1000 km in an hour using 5 tonnes of fuel. That sort of efficiency is hard to beat. Mick, ...... as you are being paid to tell people." I'd like to see you provide a source for THIS as well. don't just throw around accusations because someone says something that goes against ideas you have ingrained in you. Lead is not used in jet fuel, it has been used in Avgas (aviation fuel) which is used in small piston drive propeller planes. They do not fly at the same altitudes as jet airliners, which are the aircraft that are allegedly spraying deadly chemicals into the skies. Small prop planes also do not leave contrails in the skies, the ones that chemtrail believers allege to be deadly chemicals including aluminum, barium and strontium, or even blood pathogens and mind control drugs, depending on what chemmie you talk to. Their story changes quite frequently. That has been debunked quite frequently on this site since any sort of metal introduced to a jet engine would have catastrophic results. Whatever particles did not get trapped in the multiple filters in the fuel system and engines would get melted in the extremely hot temperatures of the combustion chamber and turbine sections, and destroy the engine in no time. Barium is used in diesel fuel as a smoke suppressant, so if barium is so deadly, we should see people getting sick all over the country from sitting behind an idling Mack truck in traffic. I don't see the chemtrail community protesting at truck stops. Engines contrails as discussed before are created from the exhausts of engines. They form in cold air at altitude, as water vapor from the exhaust forms into water droplets, contacts the extremely cold air at say 39,000 feet,(-45C or colder) and freezes into ice crystals. These millions of tiny water droplets and/or ice crystals form the contrails. The time taken for the vapor to cool enough to condense accounts for the contrail forming some way behind the aircraft's engines. If the air is already saturated, the ice crystals cannot sublimate, or melt, and the contrail will persist. Aerodynamic contrails will form off the leading edge of the wings in warm moist air, and wingtip vortices will form off the wingtips and edges of the flaps in the same conditions. So yes, in answer to your question..it is water vapor. It has not been proven to be anything else. I think some useful graphics would be helpful in explanation. Here is one, a screen capture from a site which allows you to input various chemical reactions and balance them. I used the general formula for Kerosene as dodecane. Yes, kerosene is on average dodecane C12H26 it is a mixture of hydrocarbons which vary in the range of their carbon content from C10H26 to C16H26. To see what difference the carbon content has on water production I used both of the above hydrocarbons and got these results. C10H22 produces water at the ratio of 1.3931 units of water for every unit of fuel burned. C12H26 produces water at the ratio of 1.37472 units of water for every unit of fuel burned. C16H34 produces water at the ratio of 1.35365 units of water for every unit of fuel burned. The different types of hydrocarbon can get a bit complicated. I'd avoid getting too deep into it. So when jet fuel is burnt, it makes water and carbon dioxide. Because you are adding lots of oxygen, the about of water produced is a bit bigger than the amount of fuel burnt. I'm all for KISS. Having an in-depth understanding might help when you get up against a person who is able to get above that level though. Plus it perturbs the "genius level" CT's to no end when you can dazzle them. In debate with a person who won't budge your real target isn't the opponent anyways it is the audience. When he gets trounced the truth wins by fact and logic, logical people can see that. Yes I know morons can't be taught much and the insane will never be reasonable. Yes I know morons can't be taught much and the insane will never be reasonable. I tried the ice budget argument on a chemtrail believer. The response, in toto, was: "Your argument is logical, but wrong." Some people have an allergy to learning. It's frustrating when they say "Your[sic] wrong", but don't feel compelled to explain how/why.